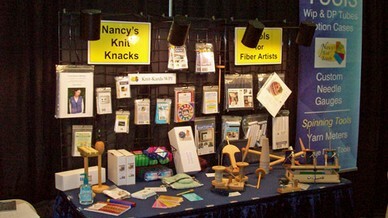 NKK makes many products for knitters and spinners. Since we do not use Reps or Distributors, you won't see our products from those sources. However, that doesn't mean that our products are not worthy of your attention. On the contrary, our products are World Class in every respect. 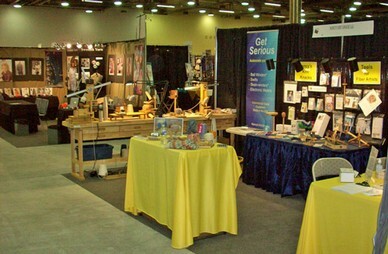 Incidentally, we do have a large booth at the Annual TNNA Trade Show in Columbus, OH. The pictures at right are of the 2013 show. Each year we meet many of our existing customers at the show and always sign up 20-35 new accounts. Try to attend the show next year and stop in and meet us! We offer a list of products that are highly functional and extremely useful for both knitters and spinners. Scarf Fold-up - Another innovative tool that manages your scarf for you while you knit it! We are the leaders in the development and manufacture of Heavy Duty Ball Winding systems, Swifts and Skein-winders, and electronic yarn metering systems. If you need a high quality, high performance winder or metering system, we are the ones to speak to in this industry. We are also a leader in the development of tools for spinners. 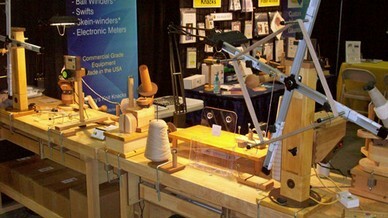 We do not make spinning wheels but make the best Lazy Kates and Niddy Noddies out there. Plus, our smaller items such as our market leading WPI Tool, Learn to Spin Kit, Spinners Lap Cloth, and Handy Andy Andean Plyer are World Class solutions for spinners and we ship them Worldwide.